Enjoying a pizza party under the gazebo with friends, on this beautiful Friday afternoon. 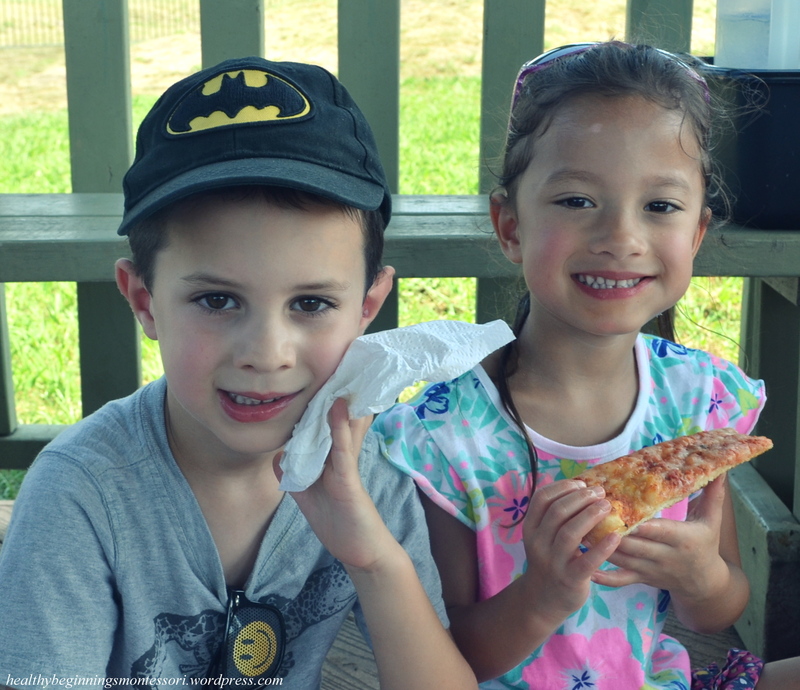 On the menu for today: tasty cheese pizza, organic milk, and refreshing watermelon…yum! Today, I had the opportunity to witness a few of our primary community members prepare the tables for lunch. Although they carried out this work flawlessly, it did seem quite challenging. They are required to take one item at a time, carrying it from the cabinet to the table, which can take several minutes. 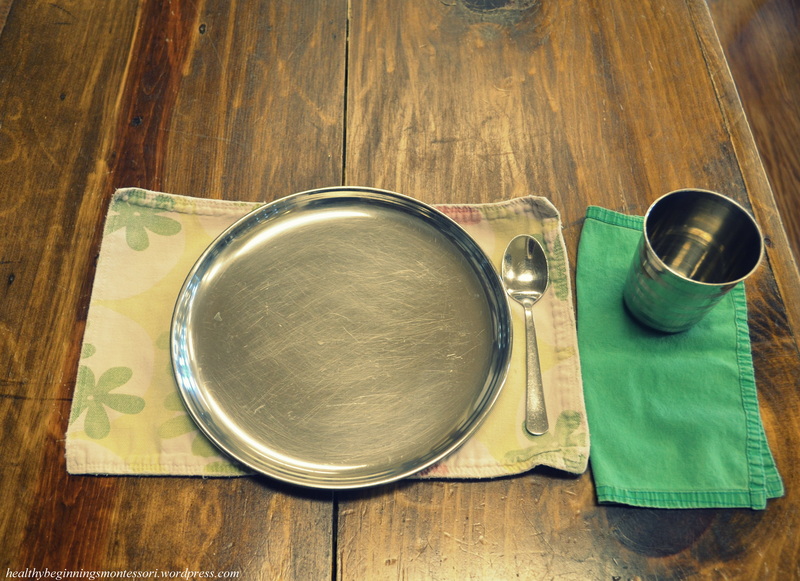 It truly did resemble a form of art, placing each item carefully on the table in the correct order. What impressed me most was the dialogue that was shared between our two, pre-selected lunch helpers. I enjoyed hearing these two young people interact and collaborate with one another. It was truly delightful! They found pure joy in the work they were doing, and carried themselves in such a way that they knew this was important and purposeful work. Not once did I see the guides intervene because it was simply not necessary. She didn’t step in to correct their errors, or straighten a napkin that was slightly offset. The task was carried out in full by the two friends, who relied on one another for help. 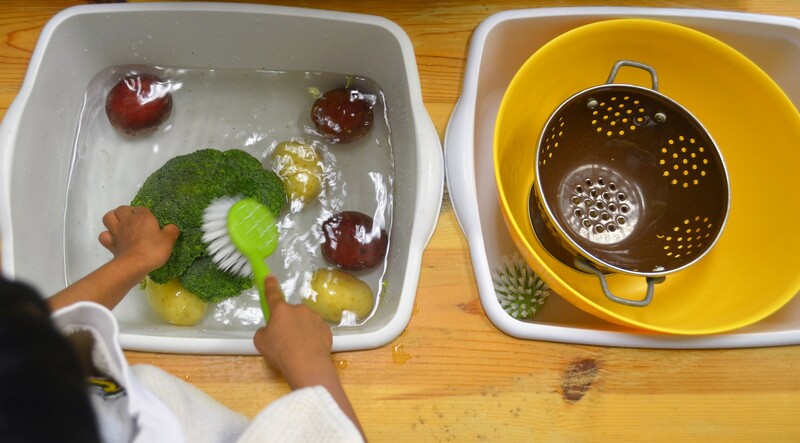 Setting the table can be defined by many adults as a “chore”, but for a child, it is a purposeful, meaningful, and fulfilling work that stimulates all of their senses. 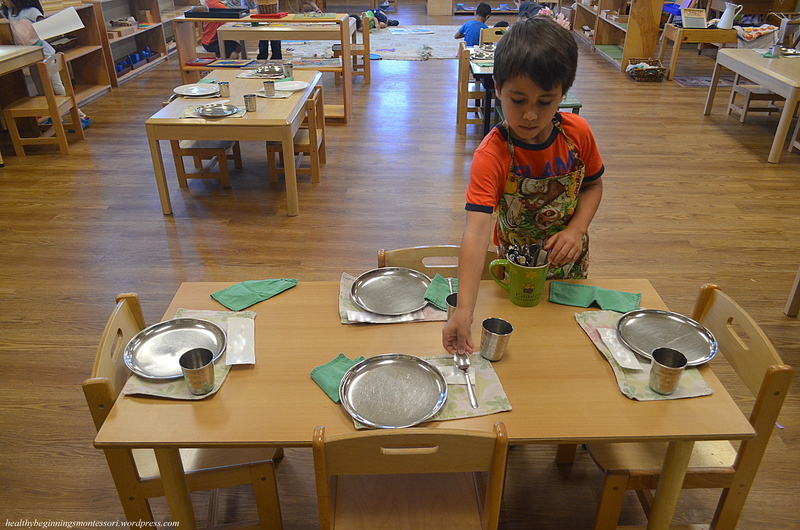 Through this work, they enhance their concentration as they focus on each minor detail, self-control as they learn to carry one item at a time, critical thinking through exploring and manipulating different styles of place setting, collaboration, delegation, and leadership skills, care of environment and care of others, and they develop a healthy self-image because the work is real and necessary. 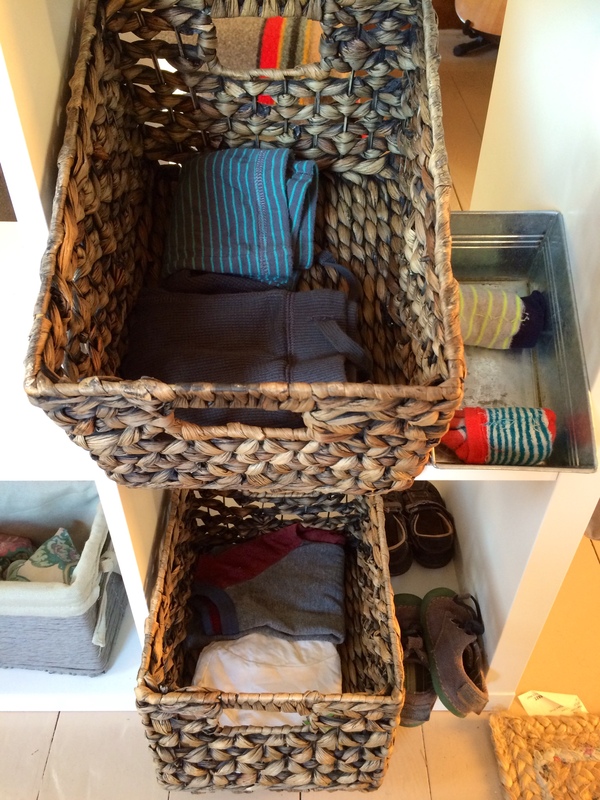 And because of this, we cannot call it a “chore” since it is joyful, purposeful work. Just like an artist carefully and meticulously paints or sculpts his masterpiece, so do our children carefully and meticulously complete their work. They understand that this is important work, and gain self-confidence as they see the outcome of their efforts; a room full of happy children eating and socializing in a well prepared environment. 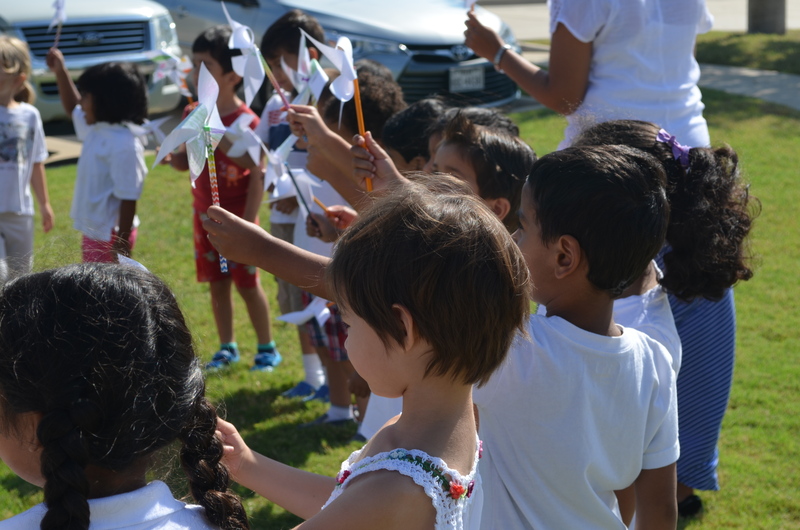 This is how our toddler community celebrated International Day of Peace on Monday; peaceful yoga and friendship hugs. 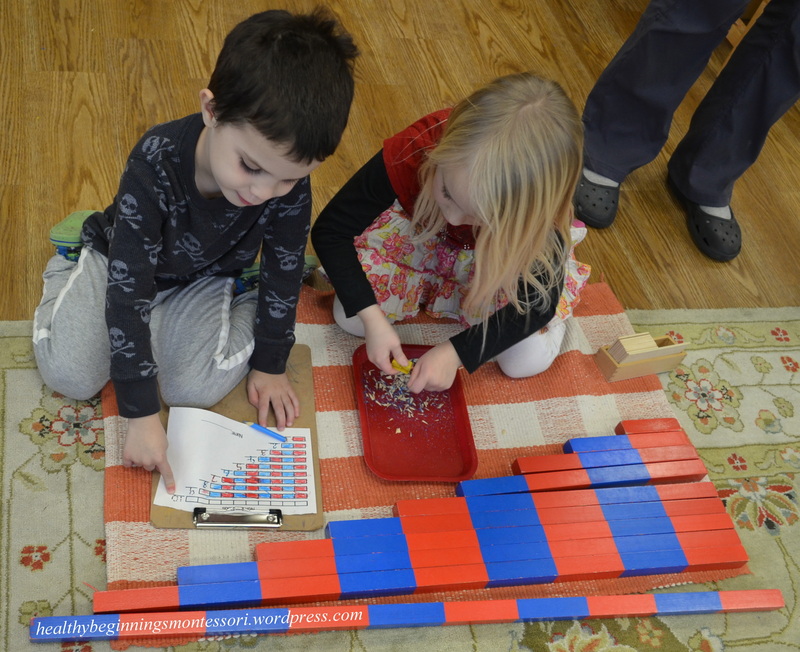 Love is a guiding force within the Montessori curriculum, and something that is palpable in our classroom environments. Love guides each lesson that is taught, through the soft, gentle voice of the guide as she demonstrates how to trace a sandpaper letter with her finger, or even modeling how to use the correct vocabulary and body language when diffusing a conflict between two friends. Love is one friend helping another comb their hair and wipe their face at the self-grooming table, or tie each other’s shoes in preparation to go outside. Love is a fundamental building block for nearly every lesson taught in the classroom. 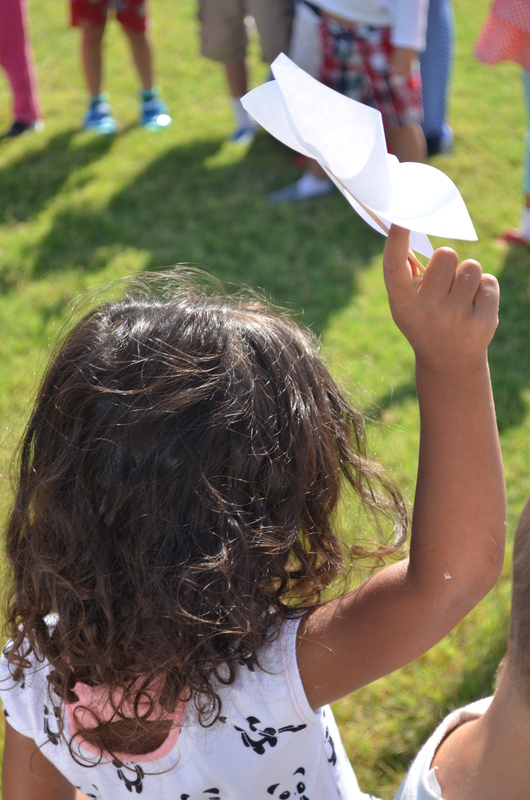 One of my favorite blogs is from Baan Dek Montessori, which emphasizes the power of love shown in the classroom, and the influence that the true nature of the child has on society. 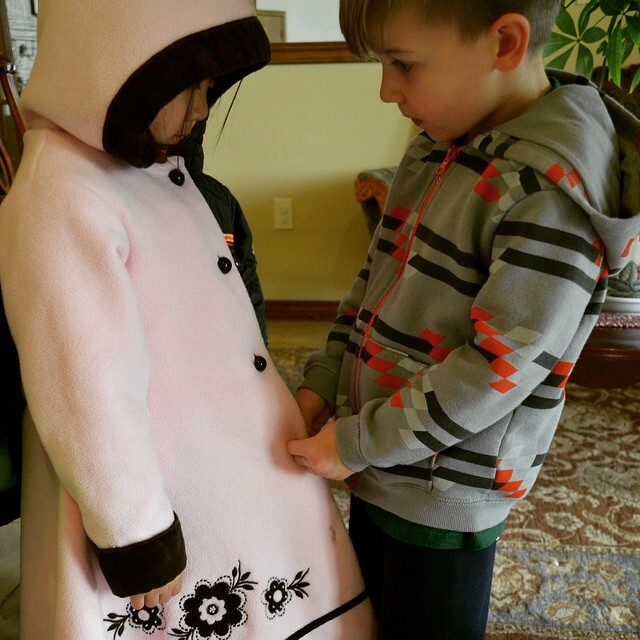 Montessori implores us to take a step back, to study the phenomenon of love, with fresh, careful, and uninhibited eyes. If love holds the secret power to unite mankind, she says, why shouldn’t we spend more time concentrated on its practical implications. In particular, why don’t we focus our attention, and turn towards the nature of childhood: the child is the point of convergence. 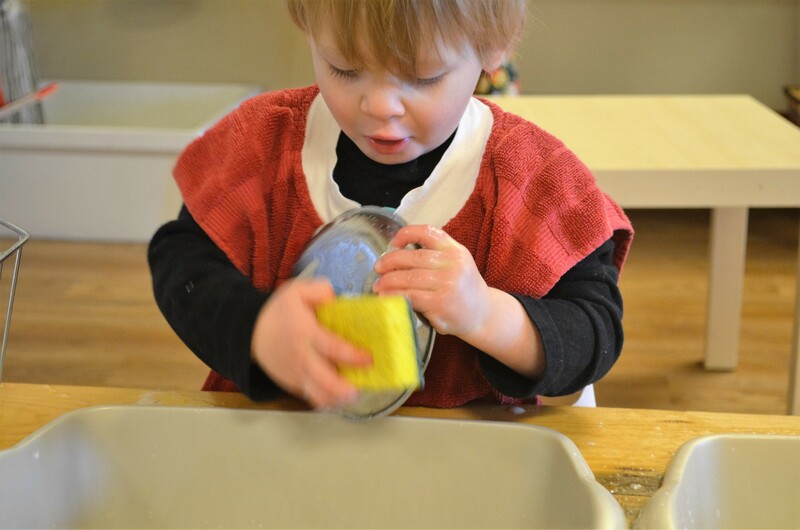 Montessori, then, changes the landscape of how we normally think about love by shifting the terrain. She tries to tell the story of love from the ‘point of view of life itself’. It’s not about desire or imagination, she expresses, but a commitment to reality. A commitment to see things how they are, and envision what they might become. Love draws us together. 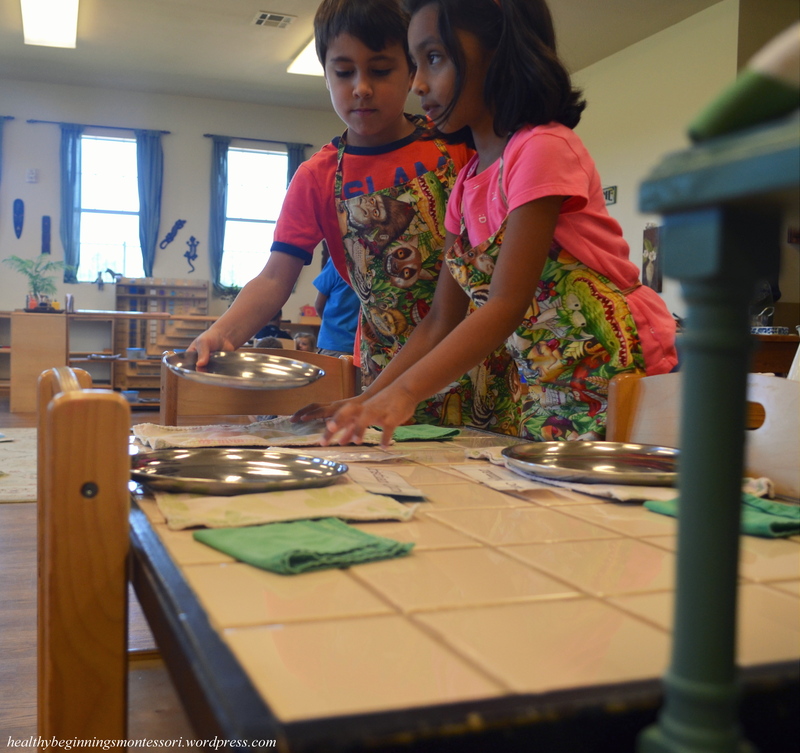 The love of learning draws us further towards what Montessori envisioned. While love may not be overtly taught, it is something ever palpable, in classrooms throughout the world. We can feel it in the pride our teacher tries to hide as we accomplish a task only days before we were too afraid to even try. We wonder, with the generosity only children can deliver, what these classrooms of love might one day yield. See the link below to read the article in full. 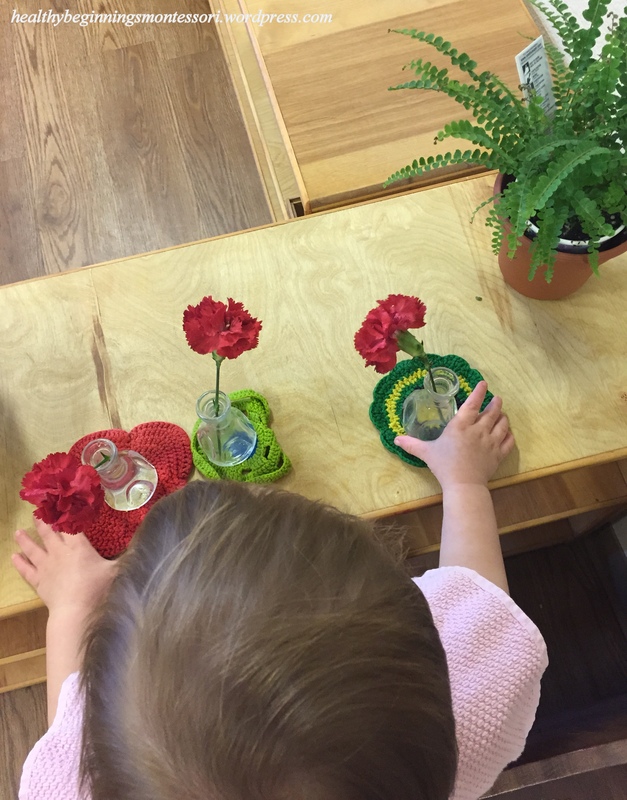 It’s not uncommon to see small flower arrangements adorning tables in a Montessori classroom. This is a work called “flower arranging”, and is a favorite for any young child. Each week, our families participate in a “flower basket” program, and bring fresh flowers for the classroom on a rotating basis. The flowers are then used for flower arranging. It’s impressive to watch a child carefully engage in this exercise. They start with putting on an apron, and then fetch water in the small pitcher provided. Now, they must control their movement while walking across the room without spilling water. If there is any water left in their small pitcher, they pour it into the tiny funnel placed in a small vase. They repeat this step several times until the vase is full. Once the flowers have been arranged, the child will display them on the shelf. Sometimes, they change the location of the vases throughout the work cycle. Now, they must restore the work area in it’s original condition. Cleaning up is a big job. 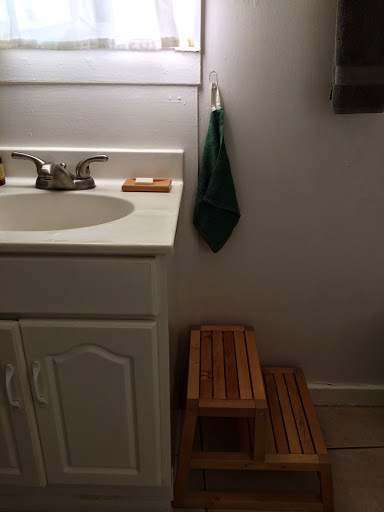 They must dump and wipe up all extra water on the table, then Swiffer the excess water from the floor which is usually a large area. It’s not uncommon for a child to be engaged in this work for over an hour. What are they learning while arranging flowers? 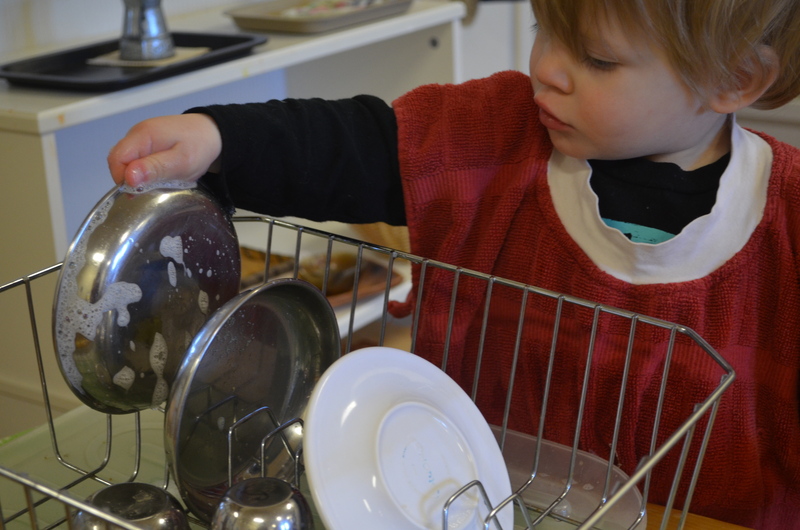 They are refining gross and fine motor skills, concentration, self-regulation, control of movement, sequencing, eye-and-hand coordination and practical life skills. In the toddler community the focus is on “care of self”, “care of environment” and “grace and courtesy”. 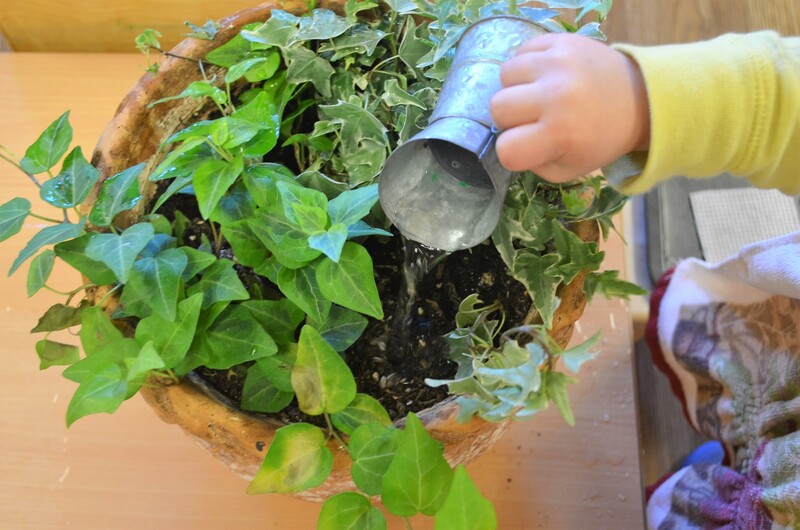 Activities such as this help the children work with purpose and concentration as they move about the classroom. 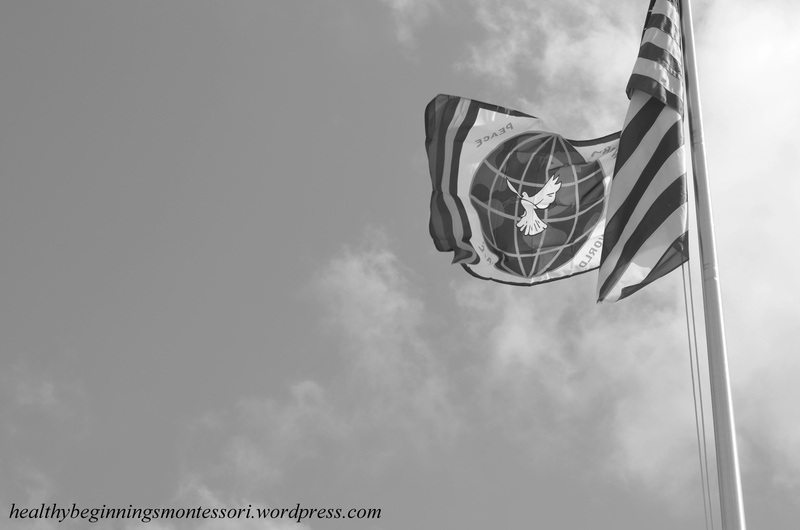 One often hears the words “grace” and “courtesy” throughout the hallways of a Montessori house. Grace and Courtesy lessons are given on a daily basis, which in turn are executed beautifully by the children with little to no adult guidance. 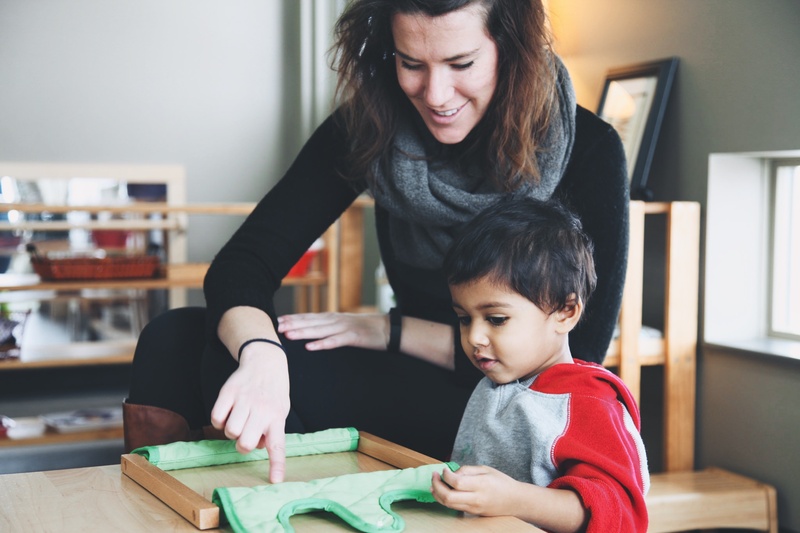 These lessons help give the child the correct vocabulary and actions to help respond efficiently to social situations around him, molding him into a beneficial member of the classroom community. Grace and Courtesy can be given not only through the kind/polite words we share with one another, but also through our actions. 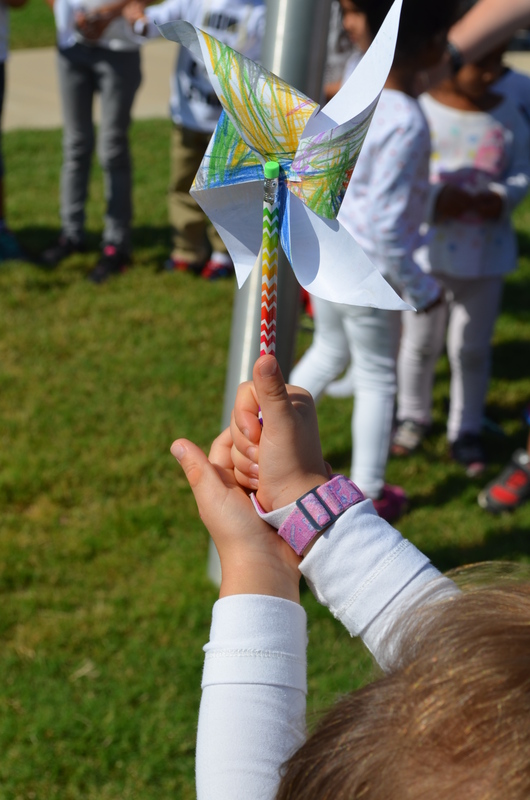 A Montessori student is driven to always have these thoughts in the back of their mind: “Are my actions going to harm others around me?”, “How will my words affect them?”, or “What can I do to show grace and courtesy to my friends?”. Often times, I get the pleasure of assisting in the classrooms whenever needed, which is something that I thoroughly enjoy. In the short amount of time that I was in our Pear Classroom this afternoon, assisting Ms. Heather as we gathered the children for outdoor playtime, I witnessed many different, small acts of kindness and courtesy. I saw friends help one another to sharpen their pencils, or put the smallest of the pink tower cube back on the display as the other friend rolled up their floor mat. I saw a friend offer to help put away nap rolls for our “late nappers”, without being asked by Ms. Heather. 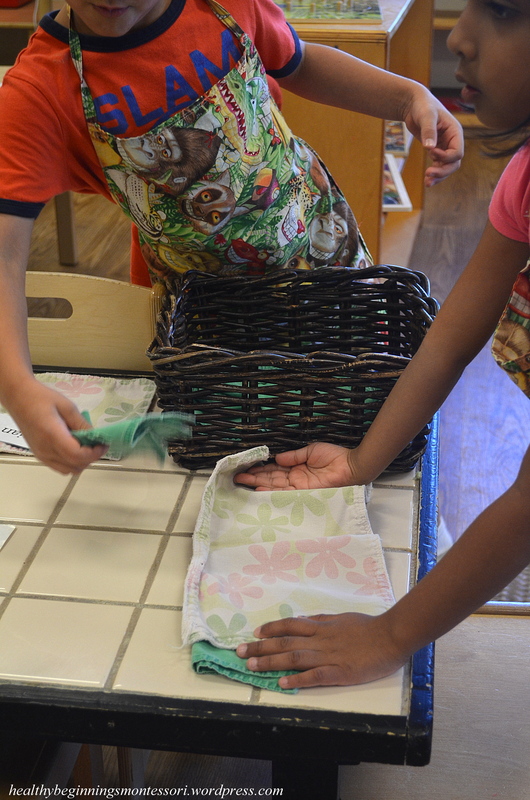 Kind words, such as “May I help you roll up your nap roll?” and “Yes, please” were shared. Two friends shared an exciting story over a snack of cheddar bunnies and cantaloupe, helping one another clean up their dishes afterwards. 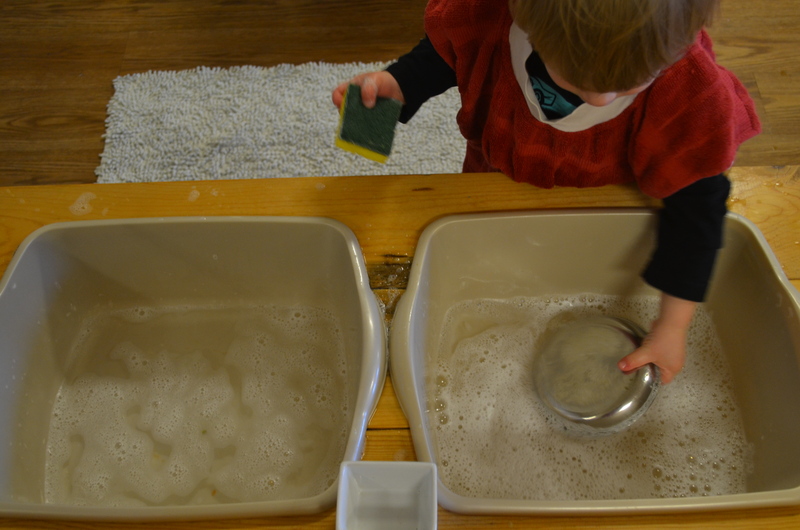 Children walked quietly around one another’s work so as not to disturb their concentration…the list could go on. This is why our community functions so well; friends helping friends in need! 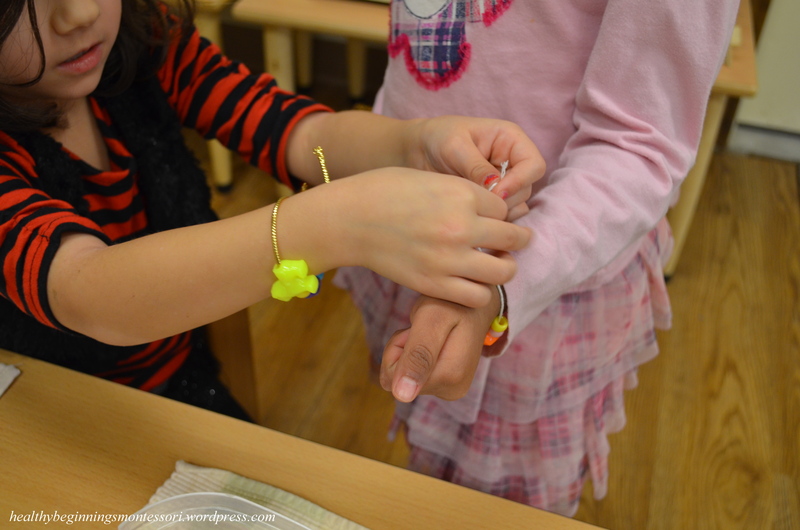 Helping hands…I help my friend tie her newly-made bracelet on her wrist so that she can enjoy wearing it. I’m helping my friend complete his red & blue rod worksheet by sharpening his pencils. What can you do to help spread grace and courtesy? Friends help friends when they are in need!